The power of our front end loader opens up new opportunities, increases workforce efficiency and puts the control in your hands. Save your energy for later and use the simple rocker switch controls to lift and lower loads up to 300 lbs. Because of the hydraulics, it is easy to back-blade. There is substantial pressure when both lifting and lowering the bucket—enough to easily lift the quad off the ground. Our four-wheeler bucket makes it easy to load anything into your pickup bed—or to pile snow high. 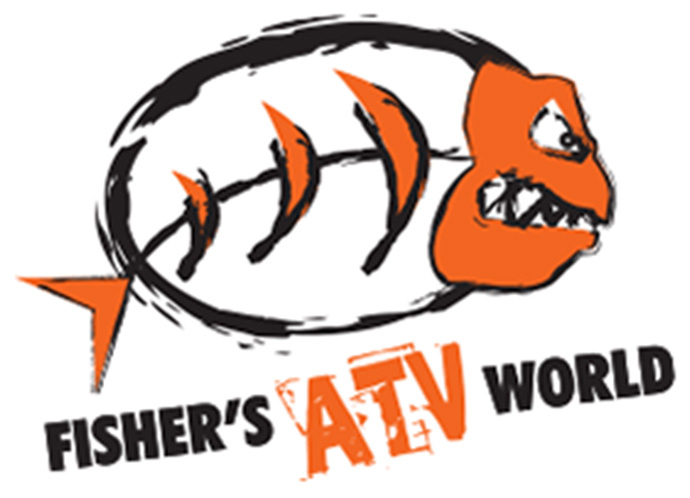 Whatever your need, our ATV equipment will deliver. The fully hydraulic four wheeler bucket runs off a deep cycle battery (not provided), has specifically designed suspension locks (included), can hold and lift 300 lbs and elevates 5 feet off the ground. This hefty quad attachment is made from steel and fits most ATV’s. Our hydraulic front loader has easy mount installation needed initially. Thereafter, connecting it takes only a few minutes. We have designed this front loader to fit as many ATV body types as possible; but due to a body change Arctic Cat made back in 2005, our attachment does not fit 05’ and newer Arctic Cat ATV bodies. A 400CC engine is recommended for this product. If your quad is out of this range, contact us directly for more details or for a custom request. Additionally, it’s important that you call your ATV dealer to check whether using our implements void the warranty of your ATV. Also, we need to inform you that the max travel speed with the attachment in place is 5 miles an hour. The manual for the Groundhog hydraulic front loader is available on our website for customer convenience. This website gives our potential, new and past clients the power of knowledge. Here, you’ll find ample information, customer feedback, and company support to make an informed decision best for you. At Wild Hare Manufacturing, we hold customer satisfaction above all else—because we’re aware of the high demand for an ATV attachment that does more than go up and down. We assure you our products won’t fall short of your expectations, like so many others on the market. Property Maintenance – Hauling snow, logs and other heavy loads. Landscaping Professional – Transporting plants, trees, shrubs, rock, back dragging, digging and even leveling ground. Horse Stables – Clean up manure, stables and transport hay barrels or bales. Hunters – A fresh kill can be heavy, make hauling it back easy. Replace any need for a wheel barrel! 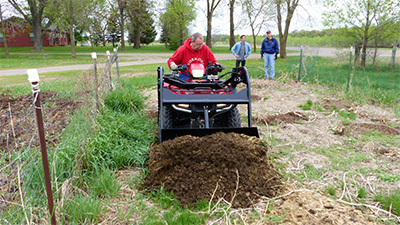 There’s more time for work or play when you equip your four wheeler with The Groundhog Loader System. Order yours online today or contact us directly with specific questions at info@wildharemfg.com or call 218-483-1000.